The University of Essex has seen a dramatic increase in student numbers over recent years and, with old AV equipment in its teaching rooms, it needed a major overhaul across its estate to improve the experience for both students and presenters. 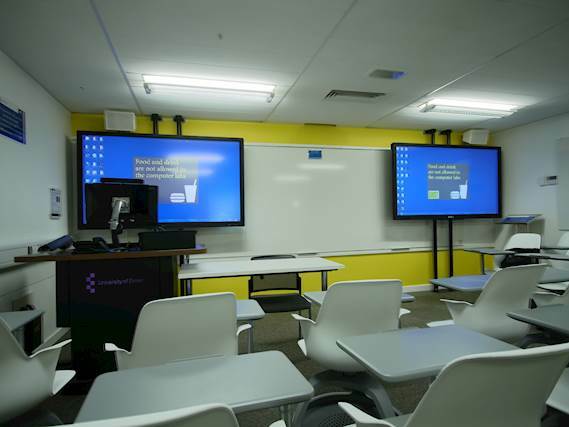 As part of this development, it needed the flexibility to deliver any kind of teaching from any room. 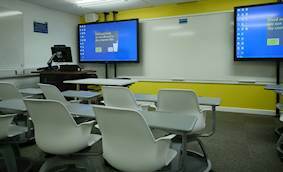 Wayne Laughlin, Learning Environment Technology Services (LETS) Manager at the university, said: “Our AV technology was old and needed updating. It was mostly composite or VGA based with very little HDMI. Much of this legacy equipment was end of life, with no warranty and finding spare parts was difficult. 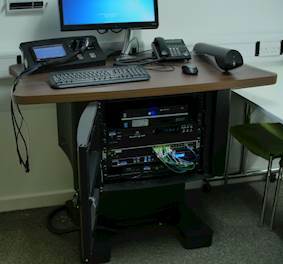 To modernise this equipment, the university wanted to change to video-over-IP, which allows content to be distributed via a media server over LAN, and install switcher scalers into each room to improve compatibility with presenter devices. “Our fast expansion into new buildings meant that we required an AV design that was scalable and repeatable with a highly effective supply chain”, he added. 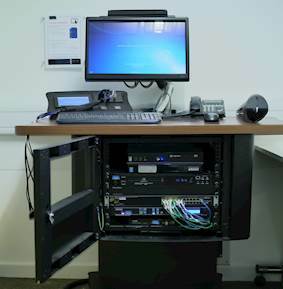 In each room, the in-house team installed a height adjustable lectern, visualiser, control touch panel, AMX SVSI video management system, amplifier, PC and a Calibre HQView620A scaler-switcher as the core integration device. The HQView620A universal audio and video scaler-switcher allows presenters to use a range of resolution inputs and automatically scales the content to a common output resolution. It also allows presenters to switch quickly between sources. Optoma’s parent company, Coretronic, acquired Calibre, the British image processing technology manufacturer, in August 2017. Since then, the core technology of the HQView620A has been incorporated into the Optoma PS200 scaler-switcher. Calibre’s HQView and Optoma’s PS200 ranges provide best in class picture quality with low latency video processing. The PS200, PS200T and PS300T all include Calibre’s class leading HQUltra 4K image processing technology with HQUltraFast input switching. Each model is able to switch input channels in as little as 0.25 seconds with easy transition between different generations of sources and displays by seamlessly interfacing between 4K, HD, and even SD signals. The scaler-switchers feature front panel controls with easy to read front panel menu plus remote control via inbuilt webserver and easy to implement API commands. All have stereo analogue audio inputs and outputs with audio-follow-video capability. There are two microphone inputs with phantom power available and an internal mixer for talk-over. The internal power amplifier provides 2x15W RMS to directly drive loudspeakers in meeting rooms and smaller conference room, plus line level balanced stereo outputs to drive an external amplifier or powered loudspeakers. Michael Rosevear, LETS Development Team Leader, said: “We looked at a large range of scaler-switchers to see what would fit for us. We chose this model not just due to the number of inputs, ability to scale and seamlessly switch between sources but also its value for money and small form factor. These create very little heat compared to other scaler-switchers on the market. This, coupled with their diminutive size, allowed us to shrink the size of the lecterns which gives a much smaller visual impact in the teaching spaces. The university has increased productivity by implementing a common specification and control architecture, making the rooms more intuitive for each user. It has improved reliability, source compatibility and uniformity. 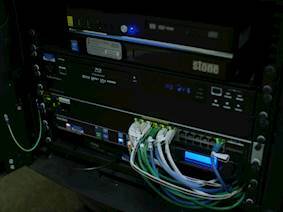 Video over IP gives presenters the flexibility on how they wish to connect to the system. Michael explained: “Lots of presenters use the inbuilt PC. 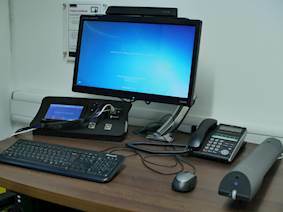 They prepare presentations on their office PC and simply log on at the lectern to access this via the network shares. Others may prefer to use their own equipment. They can simply plug the system straight into their laptops and the presentation is seamless. This is perfect for external presenters. Installation is complete across a third of the university’s teaching rooms with more to be added as the replacement cycle is completed. The university’s STEM (science, technology, engineering and mathematics) building will open for September 2018 with this uniform approach into every room. Lecterns will have the same functionality, look and feel but, rather than traditional teaching rooms, spaces will be designed for collaborative group-based learning around huddle desks. HQView620A scaler-switcher, height adjustable lectern, visualiser, AMX control touch panel and SVSI video management system, amplifier, PC.